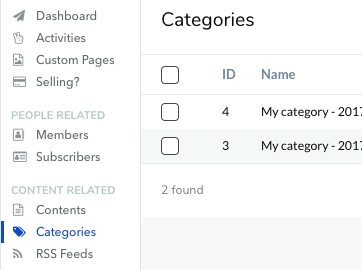 Categories help you organize your contents better and allow your visitors to navigate your site. You can create as many categories as you wish and they will appear on your parking site on the navigation area. You can manage all aspects of categories via Category Manager as shown in screenshot 1. When you click on each category, you can update its information in a popup dialogue as shown in screenshot 2. Settings in the Basic tab is quite straight forward. 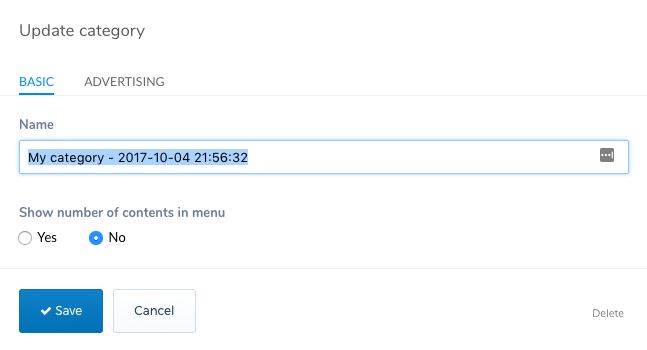 The setting Show number of contents in menu lets you display the number of contents in each category in the navigation area of your parking site. The advertising tab is same as one that was explained in the Monetization page. However, when you add advertising items at category level, the ad items you added at the site level via Settings > Monetization will be overriden by this. However, you can also add advertising items at an individual content level. In this case, the category level advertising will be overriden. You can delete a category by clicking on Delete link in the popup dialogue. If the category already has contents in them, you will see a different popup asking you to confirm your action as shown in screenshot 3. Here, you can select whether you want to move these existing contents to a new category, remove their category or delete the contents too.